Lately, I have been making better choices when I go grocery shopping. With the hubby joining WW, I realized that I needed more fruits and vegetables if we were going to not blow through our points by lunchtime. 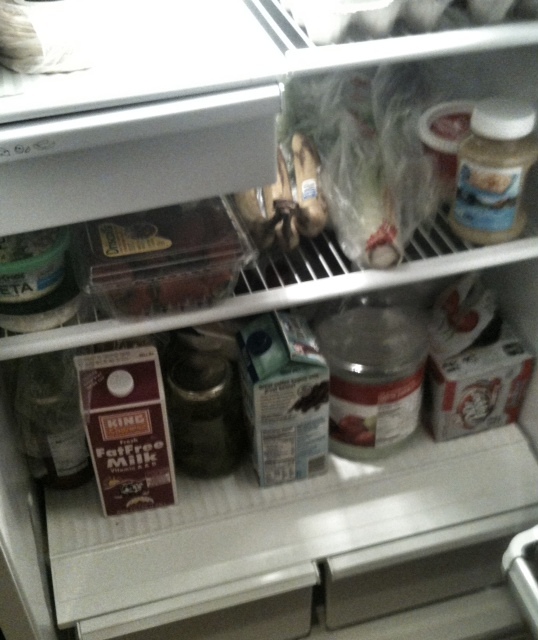 Here is a quick snapshot of my fridge in its current state, allow me to take you on a tour! On the first shelf, which I realize is impossible to see, I have about three cartons of eggs, ham sandwich meat and unsweetened applesauce. I don’t know about you, but just the smell of applesauce brings back fun memories of being a kid with a packed lunchbox. Love the unsweetened applesauce because it’s 0 PP and is so refreshing on a hot day. The next shelf has all of my fresh produce and cheeses. I have bananas, strawberries, celery, tomatoes, onions and lettuce on this shelf — and we have been incorporating them all into our daily meals to bulk up the dish and fill out those healthy check guidelines. I bought a large bottle of unsweetened applesauce to use in this recipe on the Skinnytaste website — Lowfat Chocolate Chip Zucchini Bread. Feta cheese is also used frequently around here, since we love Greek recipes. Don’t mind that red container behind the applesauce — it holds the most delicious cheese butter spread by my favorite restaurant in SoCal: Northwoods Inn. Also, please don’t mention the time I added it to a baked potato (like they serve at the restaurant) and calculated points after eating it. Turned out to be a 49 PP potato. Yea, it will be used more sparingly next time. Sigh. On the last shelf of my tiny apartment refrigerator are most of my beverages. I am not one of those people ready to cut diet soda out of my life. Sorry. So, I have a case of Diet Cherry Dr. Pepper, delicious International Delight Iced Coffee for those special days I need a pick-me-up (4 PP per cup) and a jug of Crystal Light. This jug contains the Margarita Mocktail, and while it’s good, I am still trying to get used to it. To me, it smells and tastes pretty similar to a margarita — which weirds me out when I take a gulp of it early in the day. I feel like I need to wait until the clock hits 5! I also have a random jar of pickles on that shelf, which have been delicious on my sandwiches. So there you have it. Plenty of options — and I have to say, this week I have been having snacks of celery sticks with some fat free blue cheese dressing, and it really hits the spot! Grapes are also amazing, and if I had taken this picture about six hours ago, you’d see those too. A couple of weeks ago, I mentioned that my hubby had joined Weight Watchers and I stayed with him during the Getting Started portion of the meeting — and despite the fact that I have been on the program for 15 months, the topic of weekly points kind of clicked for me. I never wanted to use them, but after talking to my leader and getting the support of friends on Twitter, I decided to just use them and track each and every item I ate. I am prone to stop tracking after a certain time, or worse — when I feel guilty about my bad choices. Last week, I tracked everything. I even went into the negative weekly points and promptly earned enough activity points to wipe the slate clean. It was the TOM as well, so between using all my weekly points and that, I was resigned to seeing a gain on my Friday weigh-in. Well, imagine my surprise when I step on the scale and I was down 2.6. I was really shocked! If I just used the TOM alone, that usually registers as a gain on the scale, so I was really surprised with the results. Last week, the topic of the meeting was finding the motivation to get back into the ‘honeymoon phase’ of Weight Watchers. Having hubby join has been so awesome for both of us. I have become much more accountable with my tracking, and I find myself making better decisions when I am feeling a weakness for less healthy options. Today we took a little day trip to Dallas, and we were saving our weekly points for a BBQ lunch. We decided to get a platter and split it to minimize our points and save a few dollars, and we were still both full. We tracked everything together and walked around for a little less than two hours to earn some activity points before having lunch. I am not sure what the scale will bring me this week, but I am feeling much better about being accountable and making smarter choices. I have been trying to get in my 100 ounces of water each day as part of the Summer Weight Loss Challenge, so hopefully that makes a dent on the scale! Well, today was my last day as a student. I can’t believe the day is finally here, but I am a little sad — I’ve been in school my entire life and now that it’s done it feels a little unreal. I have that scared/nervous feeling that now I have to be an “adult” and go make something of my life! I’m sure it will sink in pretty soon. Anyway, the purpose of this post is now that I am out of school, I really want to revamp my eating at home plan. Gone are the days where I need to grab lunch on the way to school or pick up a quick bite on the way home. Planning dinner has gotten easier, and I seem to be doing fine with finding things to make that are delicious and easy — and points plus friendly. My trouble is with lunch. Lunch is the time when my cravings hit hard for fast food, and I don’t exercise self-control. I am tired of the boring sandwiches, that let’s face it, don’t taste as good as Subway. I just don’t know what to do for lunch. My entire life, lunch was it’s own meal — meaning, I didn’t eat dinner leftovers for lunch, we had those again for dinner during the week! Now that I have grown up that way, it transferred into my adult life and I don’t reach for “dinner” leftovers. I know that must sound pretty dumb, but I guess it’s something I have to work on. I need some ideas! What are some food items that you make for lunch? I might try wraps, salads or refreshing items, but I also want to find things that will help satisfy me as I wean off of the convenience foods this summer. This time around, I decided, the only reason why I allow myself to have them is A) they are in the house and B) I have no self-control. So, by not even buying my trigger foods, I didn’t have to worry about binging on chips and cookies this time. Needless to say, even WITH the time of month I don’t feel as bloated or as heavy as I usually do — in fact, my brand new Weight Watchers scale is showing a two pound loss since Friday’s weigh in. I hope it stays as nice in the next couple of days. Another thing I have done differently this week is use my weeklies. I have been such a dope about these extra points, it’s kinda embarrassing to even talk about them. I get 31 daily points, and on those days where I go over, I stop tracking. Nevermind that I get 49 extra points to work with, I just don’t acknowledge them. In my mind, using the extra points means not seeing a loss on the scale, but you know what? Not tracking my points leads to a gain on the scale. Stupid me!! Hubby joined WW on Friday, and when I stayed for the Getting Started meeting, the topic of weekly points just clicked. I have used my points for a date night dinner — where something else occured. Hubby and I used portion control and tracked before the food even arrived at the table. Extra weekly points have also helped when I have been getting lots of activity this week. Hopefully I start making some great progress, and the hubby has been doing so well and it’s rubbing off on me. I’d like to leave you with a picture of someone I met on Twitter when joined as @BikiniCountdown. Her name is Mae, or @ReducedFatGirl if you know her on Twitter. 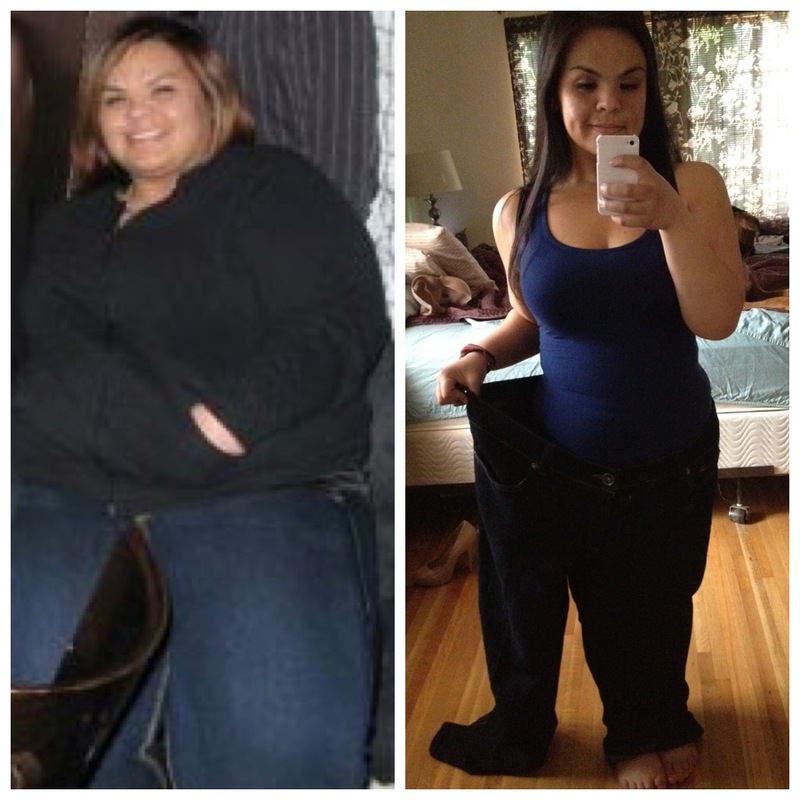 She has been such an amazing inspiration to me and countless others on her weight loss journey and dedication. She started her journey in May 2011, and look where she is today!!!!! If that isn’t inspiration to work hard and know you can achieve your goals, I don’t know what is. A few weeks ago, I took part in an 8 Week Weight Loss Challenge and I’d say it helped alot. I didn’t lose very much in the eight weeks, only a few pounds, but the constant challenges and support from everyone who participated was really helpful. Once again, another 8 week challenge is taking place for the summer, this time hosted by the lovely Sarah (@SarahLou1976) — her blog, UK to California has all of the information, and I am really looking forward to weighing in on Friday and giving her my starting results. With school completely done in a less than a week, I want to focus on my health and fitness over the summer and start making some positive changes in my post-grad life. You can email or tweet your starting weight to Sarah by midnight on May 12th. Send her a picture of the scale number, or a screenshot of your Weight Watcher’s weigh-in. Don’t forget to send her your first name and last initial (and Twitter handle if you have it) so she can add it to her blog. So, whether you’re on Weight Watchers or not, I recommend you join! It’s a great way to kick off summer feeling and looking better. A huge thanks to Sarah for moderating the challenge!! When I hear people at Weight Watcher’s meetings complain that they have no support for their weight loss journey, I just can’t identify with it. Every single one of my close friends is so supportive of me being on Weight Watchers, and many of them are also on the plan so I know I can write or call any of them (they live in CA) and talk about my success or struggles — we are in it together. Hubby and I have quite the past of joining Weight Watchers, losing weight and thinking we can maintain it on our own after we lose 10+ pounds. He is so supportive of me, and is always there to talk no matter how many times I repeat the same topic of conversation. We both need to live a healthier lifestyle and drop extra weight, and the other day I had a brilliant idea — he could join again, which would help him reach his goal and help me stay on track. I already make menu options from Skinnytaste and Weight Watchers, but we really struggle with fast food. Hubby is much better at self-discipline than I am, so doing Weight Watcher together will keep me motivated and focused. I also resolved myself to make this attempt at doing it together a little different than last time. In the past (and I still struggle with it) I compare my weight loss journey to everyone else’s. When hubby joined the last time, he tracked everything and lost a good deal of weight in the same period of time I was bouncing around the scale. Never mind I didn’t track, ate a ton of food then starved the day before weigh-in… I just felt like Weight Watchers wasn’t working for me. LAME. Now, I have started to focus on myself. My journey is different than his, my friends or new friends I make on Twitter. He IS going to lose weight faster than me, he’s a guy! If I follow the plan and get in my activity points, I will see results. This time I am going to cheer him on and celebrate his losses, rather than sulk during the meeting because I didn’t lose any weight. To kick off my resetting, I stayed after the regular meeting and got a refresher course of the plan, and learned about Power Start once again. Since the last few months have been very bad around the TOM with cravings, I decided that if it wasn’t in the house, I wasn’t going to be tempted. So far, so good. I bought fresh fruit and veggies to enjoy this week, and I hardly consider Skinnytaste recipes being on a “diet”. I mean really, do those options sound like diet foods?! I think not. Skinnytaste is THE best recipe blog for those who want to have great tasting food and stay on track. Love it! So, as I mentioned in my last post, I fell off the wagon. It always happens — I had a very good weigh-in, got only four pounds to my personal graduation goal, and then I stopped everything. I didn’t track, stopped making food at home, didn’t go to the gym and there is no good reason for why I didn’t do any of it. It’s easy to say no, to say “I can’t”, to expect the worse, and doubt yourself. Expecting the worse feels safer because when you fail, you won’t be disappointed…Fear, doubt, and defaulting to no are reasons why so few people end up where they really want to be. This really hit the nail on the head for me. I find it easier to say ‘no’ to choosing to eat at home, rather than go out to eat. I find it easier to say ‘no’ to going to the gym, rather than earn some activity points. It made me wonder — is there something I am afraid of that makes me give up on myself every time I get close to a goal? I have been on Weight Watchers for 15 months, and in that period of time I have lost 23 pounds — and adding up all the times I gained and lost the same weight, I’d probably be about half way to my goal by now. I am disappointed in myself, that I don’t value my health enough to stay on track. While the scale at home says I have gained four pounds since my last lowest weigh-in, I find myself trying to start over again with the program. I have been eating out so much, just the thought of making food at home is a huge struggle for me. With graduation just ten days away, I realize I am probably not going to lose the 8 pounds I needed to meet my personal goal. Once again, I set a goal for myself just to fail. I have made countless countdown goals — my birthday, the hubby’s birthday, wedding #1, wedding #2 three years later, UGH. I have decided that a new change I am implementing is no more countdown goals. Hubby gave me a bit of advice — if you track, exercise and drink water, you will hit your goal no matter what. I don’t need a countdown clock, I just need to stay on track. I’m just going to focus on the day-to-day and hope I start feeling more confident!